This is the area of UK where Mom is from Kiddeminster still has family there. It was very exciting to go there and see it in Aug 2006. 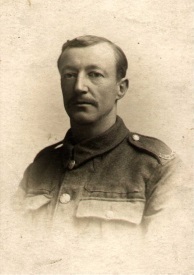 A photo of C.H.G. Wheeler. He is here proud in his WW1 uniform. This is the Family tree laid out by Charles T Blake. I am putting it into this form, which, while some-what crude allows me to upload it. The Photos at the top are to introduce my origin and separate it from the rest of the tree. 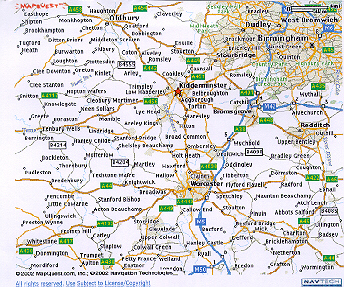 This Map of Stourport-on-Severn, Worcestershire GB is where I was born. Just a little south and east is Ombersley where my Mum, Margaret C Pheysey is from and where Peter and I lived before coming to Canada in 1946. 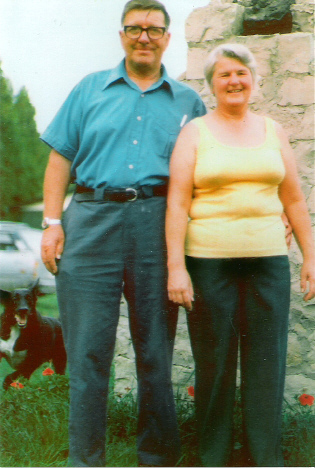 The couple in the photo is Dad and Mum, Albert Leslie Wheeler & Margaret C Wheeler. This photo was taken at their home on the Bruce Penn. in Ontario Canada in 1978. Florence Wheeler married Samuel Cox born 1903 died 1974. They had four sons. Robert born 1926, Edward J born 1927, Murry born 1929, and Roger born in 1939. 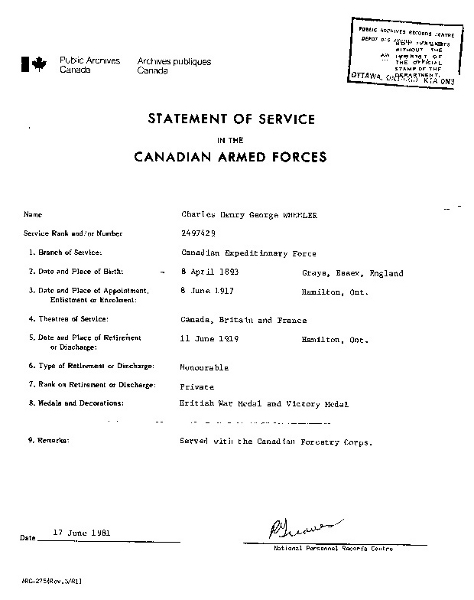 Robert Cox was married to Evelyn Rounding they have 5 children. Linda born July 10, 1947, Jenny March 13, 1954, Roberta Born Oct. 20, 1956, Steve born May 17, 1962 and Elizabeth born July 1, 1969. Roger Cox was born April 12, 1939. He was married to Carolyn (Smith) her *Aunt married a Blake* she was born Feb 6, 1941 (they married June 24, 1961) They have 3 sons Brad born Aug 15, 1964, Brenn born Dec 24, 1965 and Todd born July 11, 1967. They have 3 Grand children. Brad has a girl Rachel born Aug 24, 1995. Todd has 2 Caitlin born April 1996 and Brian born Sept. 16, 1999. Greg Mark married twice 1st to Robin Galey born Mar. 24, 1968. Divorced. Second marriage to, Jacqueline Wyss. They have two children. Jack Phillip Wheeler born Aug.10,2001. Linden Irene Wheeler. November 13, 2003, 9lbs 6oz. Scott Albert from relationship with Connie Nelson 1 child. Hanna Dawn Nelson born Mar. 21st 1995. Scott then marries Terri Earl born Feb. 21, 1969. Paul Alan married Theresa Lawson born April 14. 1968. Their marrage ended and Paul married Ava Maxine Newman. They have tree daughters. Terry Anne Wheeler. Born June 8, 1973. Terry Anne married Christopher David Matthews Born Feb 11,1969. Wedding Date July 8, 2006 Terry Anne and Chris have a new baby Florence Elizabeth Wheeler Matthews. Born Feb 9 2008 in Windsor Ontario. Andrew Christopher Harris Matthews Nov 9 2010 at Windsor ON. Paul Robert Wheeler born May 29, 1948 first to be born in Windsor Ontario Canada. Married Anne Holinworth. They have three daughters. Amanda Sarah Rebeca. Paul and Ann Divorce, Paul common law with Jan Soucy. Married to Jan Sept 2009 White Rock BC CA. Amanda Married to Renny Mungal Oct 2007. Thomas Leslie married Carole Ann Lariviere born Feb 7, 1969. They have two daughters and a son. They are Stephanie, Danielle, and Benjamin. Lesley C Wheeler Born Oct. 24, 1955 She married Rick Lawson They have three children. Travis born Nov. 9th 1975, Tracy born Oct. 10th 1976 and Shannon born Apr. 15, 1982. They divorce. Feb 14 1986. He has his own 3 children. Blair born May 23, 1970, Mellisa born May 10, , Trevor born June 4, 1976 He died of heart attack Dec. 1990. Janet E Wheeler born Nov. 29, 1961. Married to Calvin Hastings. They have two children Dianna Malissa born June 29, 1984. Andrew Mark April 14, 1987. They are now divorced.